At the Schedule step of the wizard, specify the schedule according to which you want to perform backup. Make sure that the Run the job automatically check box is selected. If you want to configure the backup job without schedule, you can clear the Run the job automatically check box. In this case you will be able start the configured backup job manually at any time you need. In the Daily at field, specify the time of day when the backup job must start. In the list of days of the week, specify days on which the job must start. By default, Veeam Agent for Linux will start the backup job daily at the specified time. To exclude specific days from the schedule, clear check boxes next to the necessary days. 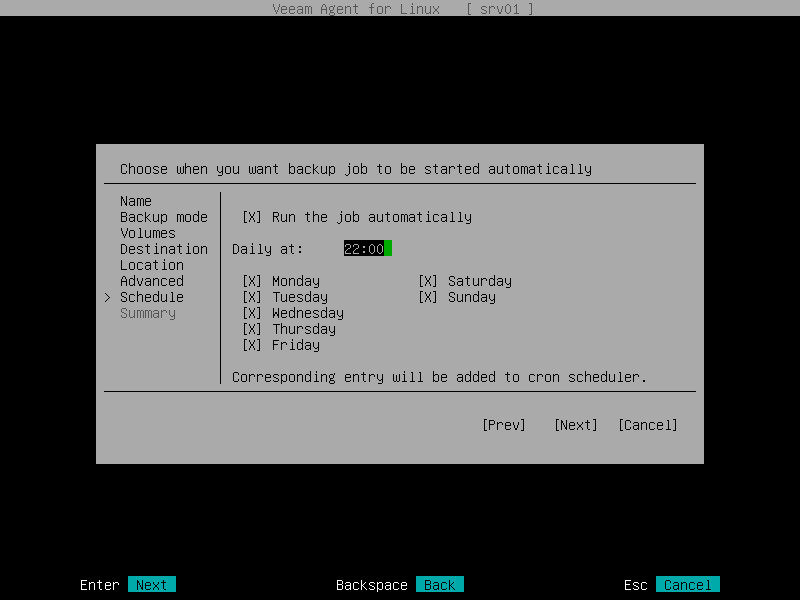 Veeam Agent for Linux will save the scheduling settings for the backup job in its database and in the crontab configuration file of the root account. Thus, Veeam Agent for Linux can start a backup job automatically regardless of the currently running user session. You can change schedule settings at any time in Veeam Agent for Linux or edit the crontab file manually to fine-tune the schedule. To learn more, refer to the Cron job scheduler documentation.